Bacon is a meat product prepared from a pig and usually cured. It is first cured using large quantities of salt, either in a brine or in a dry packing; the result is fresh bacon. Fresh bacon may then be further dried for weeks or months in cold air, or it may be boiled or smoked. Fresh and dried bacon is typically cooked before eating. Boiled bacon is ready to eat, as is some smoked bacon, but may be cooked further before eating. 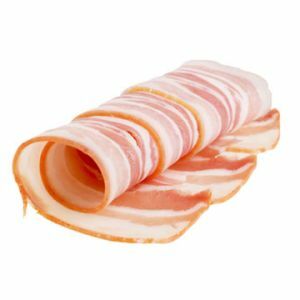 Bacon is prepared from several different cuts of meat. It is usually made from side and back cuts of pork, except in the United States, where it is almost always prepared from pork belly (typically referred to as "streaky", "fatty", or "American style" outside of the US and Canada). The side cut has more meat and less fat than the belly. Bacon may be prepared from either of two distinct back cuts: fatback, which is almost pure fat, and pork loin, which is very lean. Bacon-cured pork loin is known as back bacon. Bacon may be eaten smoked, boiled, fried, baked, or grilled, or used as a minor ingredient to flavour dishes. Bacon is also used for barding and larding roasts. Bacon is cured through either a process of injecting with or soaking in brine or using plain salt.